This blog post will have you fallin’ in love. Brunch is the most romantic meal for me. If my husband wants to sweep me off my feet (and he does, what a great guy!) he prepares brunch for me. Every time I come home from yoga on the weekend to find he’s prepared brunch, I fall a little harder for the guy. 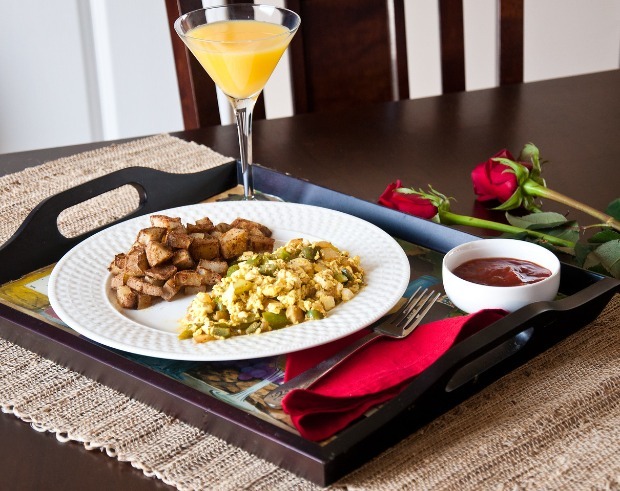 Lately I’ve been obsessed with Cajun foods, so Tofu Scramble with Cajun Potatoes are what I want on Valentines Day. Plus I also find in order to be fully satiated, I need a starch like toast or potatoes to go with my tofu scramble. Preheat oven to 375F and line a baking sheet with parchment paper. Cube your potatoes and rinse them under cold water in a colander. Shake off excess water but you want them to be damp. Toss generously with Cajun seasoning (I also add oregano) plus salt and pepper. Spread out on your baking sheet and bake until roasted around the edges, about 20 minutes. The one-way ticket to Scott’s heart is Mexican Food. He LOVES anything Mexican, especially burritos and enchiladas. 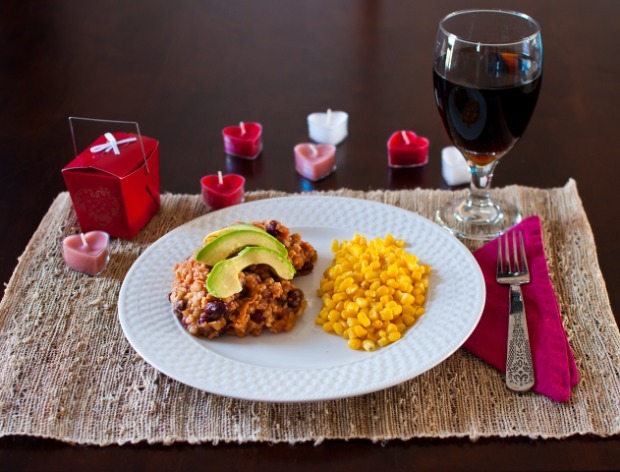 Since Valentine’s Day is falling on a workday this year, I’m making Crockpot Mexican Casserole so dinner is ready when we get home. for 4 hours, or on low for 6-8 hours. Top with avocado, serve corn on the side. Lower Fat: Omit avocado, scoop with 2 corn tortillas per serving. Add-on: Add more corn. Prep: Make ahead. 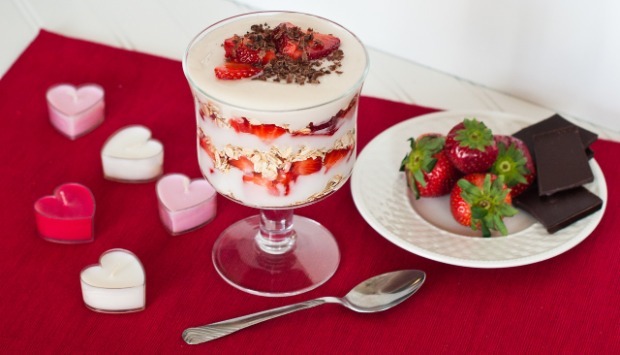 For dessert, I’ll probably keep it simple with chocolate (we both love dark chocolate) or if I have a little extra time to pick up strawberry or cherry flavored vegan yogurt, I’ll prepare these lovely Strawberry Parfaits. My favorite parfait is layers of yogurt, rolled oats (or granola, or Oreo cookie crumbles if you’d like) with fresh fruit slices. There’s something luxurious about the contrasting textures of creamy, crunch, and fresh. 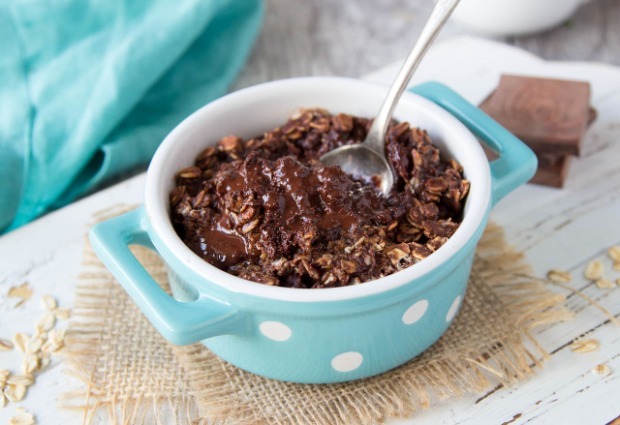 Get my recipe for this incredible (and healthy) Chocolate Lava Cake Oatmeal and other “date night” favorites as part of your 7-day free trial to Meal Mentor here. Previous PostPrevious Whipped Lemon Ricotta Cheesecake.